A continuation of my recent blog post about how one prepares for the sort of trip I've been planning for the coming summer and fall. I did my first trial run of my backpack today! (I couldn't wait any longer - I'm only a month out from leaving CA!) With all of my gear and clothing I'm about 5 pounds below the weight limit at which most budget airlines can change you HUGE bucks to check a bag (15 kg). There is even room for buying some things along the way! For the first three months of the trip, I'll be in warm, Mediterranean climates, and doing a lot of work on farms, then my clothing needs will change dramatically. When I arrive in Northern Ireland in October, I'll have my mom send me a box of sweaters, socks and a coat. The last time I spent 3 weeks in Ireland it was July and I wore a sweater 2/3rds of the time, so I'm anticipating needing to change up my wardrobe for sure during the end of fall into winter! I've been purchasing lots of light-weight, wrinkle resistant clothing, including Columbia and North Face brand t-shirts, tanks, dresses and pants. These are a little pricey but they are so easy to pull out of a bag and throw on, plus they are light-weight and will stand up during the work I'll be doing on the farms. A lot of this packing list was developed based on research from herpackinglist.com, which is full of great tips from many real women out in the world, as well as of advice for how a woman can meet all of her hygiene needs on a long trip. With a mesh bag to throw my dirty clothes in and keep them separate as they accumulate, I'm hoping to have early access to laundry facilities of some kind about every 2-3 weeks. This is where the quick dry/travel underwear come in handy. I used them on the Inca Trail and all you would do is wash them out the night before, leave them hang for the night (or 20 minutes if you are in a warm place) and they would be perfectly dry and ready to wear in the morning. A pinch of Broner's Magical Soap and a sink stopper in a hostel will also do just fine, along with a braided laundry line. I've got some Tide-To-Go sticks in my purse as well. As I've mentioned before, I've decided I'm not giving a damn about how fashionable I look. 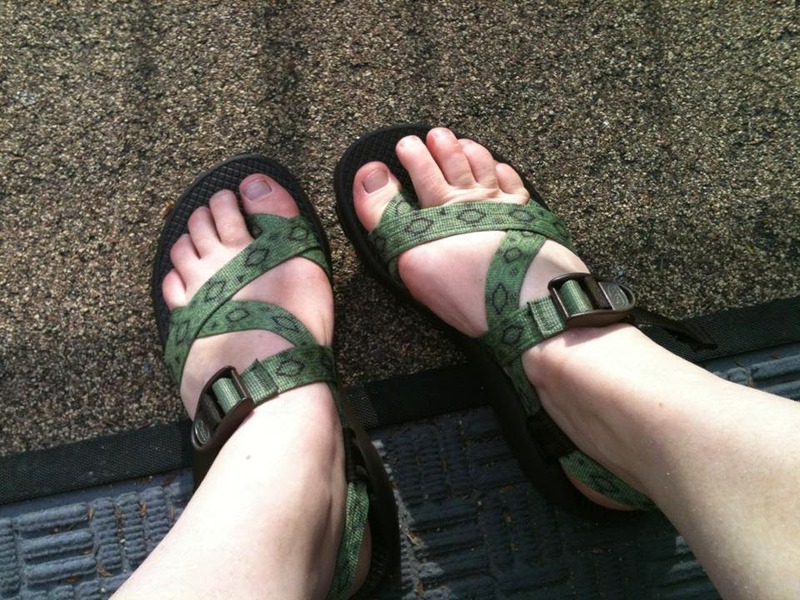 I've had Chaco's for a year and if the Californians don't get or like them, I'm fairly sure the Europeans won't either, but I've decided not to care. When you know you're going to be walking around all day every day in a pair of sandals and you have high arches like me, you certainly want good foot support. I also purchased a new pair of hiking boots, for long days on the farm, actually getting from place to place and for any hiking I may end up getting the opportunity to do. The ones which took me through many mountains in California and throughout the Andes in Venezuela and Peru were falling apart to rapidly to trust them abroad. The last shoes I have, since both of the above pairs are pretty basic and outdoorsy, are a pair of slip-on black flats, which roll up into each other then into a nice little case and can be stowed away into a corner of my backpack for any fancy occasions I may encounter. They were cheap and the plether is thin, so they are a once in a great while sort of wear. 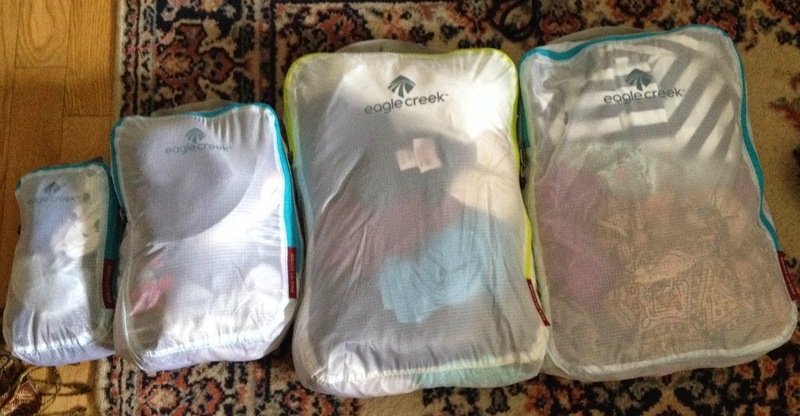 I came across these Eagle Creek brand super light traveling cubes recently, and I'm SO glad I invested in them. When I first opened the box, I was skeptical, thinking, how will I actually USE these? Now I see how great it can be: socks and underwear in their own, t-shirts in another - no shifting through all of your clothes to get to the clean sleep sack and messing up all the careful packing you've just done. I am so excited to use these on an upcoming back packing trip, as well as while I'm abroad. Questions about other packing, items I'm buying? Problems I'm trying to solve in advance? Comment and I'll do my best to answer - or I'll throw you a more educated answer on the road! For some reason I find packing lists like these so interesting, so I'm glad you posted! I'm glad it's not me who will be only washing her underwear properly every 3 weeks, but I sure am glad you are making your dreams come true! I will be following along for the ride.